What God accomplished for us through the birth and ministry of Jesus is a reason to rejoice for all time because His name remains Emmanuel. May this be our portion forever in Jesus’ name. Amen. Lovely, sweet, delicious poem to savor! Thank you sister Edith. Pinning on Christian poetry board! God bless you very much, my dear Tammy! I thank God you like the poem. What a sweet little poem! Thanks a lot, Maureen! I hope, by God's grace, that it gives a little encouragement to readers. You are blessed! Forever and ever. May your year's end bring all your anticipated blessings in Jesus' name. He is with us, through the fire and the water. Amen and bless you, Miracle! In the arms of his love i find rest! GOD IS A GOOD GOD, CARING FATHER. HE IS WONDERFUL AND FAITHFUL, MAY HE BE PRAISED. Amen. And may you be blessed in Jesus' name. God is always with us. All we need do is to seek him. He is ever faithful. sometimes we go through tough situations and we try to solve them on our own forgetting that we have our Emmanuel who is always with us. 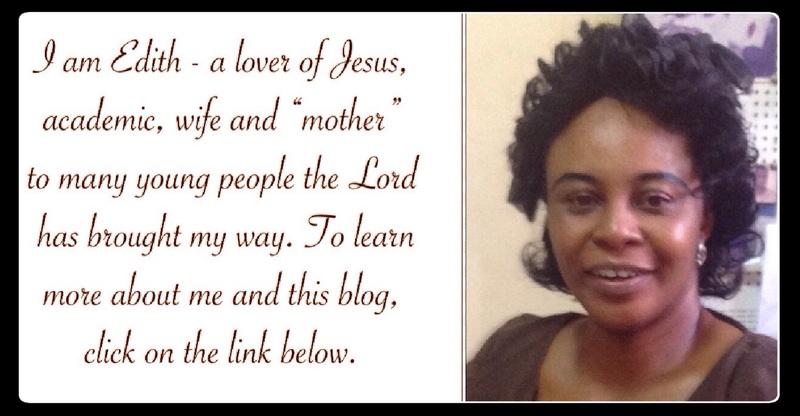 Thank you Ma for reminding us about the love of Christ. God bless you, Aunty Edith. Amen and God bless you too, Chinwe! Amen and remain blessed too, Daniel! EMMANUEL! GOD IS TRULY WITH US!! Amen. Have a spiritually fulfilling and favour-filled Christmas in Jesus' name. EMMANUEL! GOD IS WITH US AND IF GOD IS WITH ME NO MAN CAN BE AGAINST ME,HE IS AN AMAZING GOD,INDEED IN HIM I KNOW LOVE, JOY, GRACE, PEACE, AND MUCH MORE. THANK YOU, LORD, FOR YOUR BIRTH AND MY BREATH. Nice alliteration: Your birth and my breath. You are blessed, Delise! God is really with us, and he is the reason for this season, his grace is always sufficient ... there is no greater love than the one he showed us. I love you, Jesus! I echo that. I love you, Lord Jesus, so so much! Emmanuel! u are all in all... what more do I need ? when u are everywhere dx Christmas and always ... to you be all glory given, for we adore your presence always and forever. "Emmanuel-God with us" this uplifts ones spirit when it seems like all hope is lost. thanks ma for publishing this passage from the Bible plus other verses included. Christ in me is the hope of glory... Thanks ma for I am encouraged by this piece. "Emmanuel - God with us"
'BEYOND THE ORNAMENTS AND THE LIGHTS'. CLOSER THAN OUR SKIN IS TO US. CLOSER EVEN WHEN WE PRETEND HE IS NOT. GOD... WITH US, IN US, FOR US. 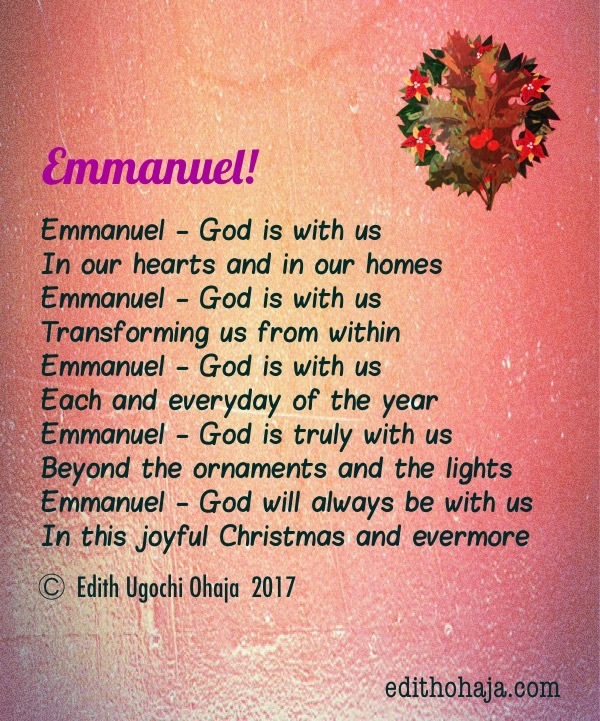 God is always with us “Emmanuel”, even the way the name sounds in our mouths is a thing of joy coupled with the fact that it means a lot in our lives. if there is no Emma in your live, what are you then living for? MA I wish you Emmanuel in this Xmas period. Fear not for thy God is with us...I have always had deep passion for poems. I love this piece; it's simple and concise. Also accompanied by scriptural backups. The name alone is enough to destroy thy devil. 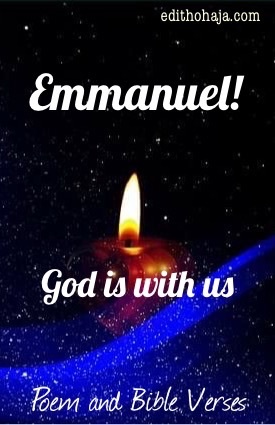 Emmanuel, ''God is with us''. I need you, Emmanuel to guide my footsteps. Thank you Jesus! Truly God is with us. He perfects and directs all which concerneth us. Emmanuel may your name always be glorified and may the joy of your birth never cease in our lives. Faithful and excellent God. Indeed, it is, Ifeoma! May that grace multiply upon your life and distinguish you in Jesus' name. I myself am a living testimony of Gods goodness...indeed! I can say God is with me. EMMANUEL, THANK GOD FOR GIVING YOU TO US. AMEN. Emmanuel is God from beginning to the end. There's no place for argument, He is GOD all by Himself. Welcome to 2018!!!! Emmanuel!!! God is truly with his people in all that they do. He was, He still and will forever be with His people bt we don't know this. We shy away from his presence. God give us the grace to seek his face this new year, in Jesus name Amen!! A very nice poem. All I can say is Amen because our God truly liveth. If it has not been the Lord who is on our side, when our enemies rise up to swallow us alive, If it has not been the Lord who is by our side when they (our enemies) planned to wipe us off the face of the earth. The Lord by our side is our victory assured! To God be the Glory. Emmanuel, God is with me. The joy of the lord is my strength. If it has not been God, where would i have been. He is my joy and fortress, my pillar and my hedge. He has always been with me and forever will be. The coming of Emmanuel is a very wonderful event on earth. Mankind can never comprehend what would have happened if he wasn't born. Emmanuel, God is with me and i give him the praise and worship. EMMANUEL.. GOD IS WITH US AND NOT AGAINST US.. Thank you ma for the write up. The bible can inspire one to write many things such as a beautiful write up like this. May the good Lord inspire you more, Ma. it should be worth noting that the significance of Christ birth is that God has come to dwell among men thereby bringing peace to men. God being with us now is accepting Him into out hearts and homes to illuminate and decorate our lives which is everlasting more than any Christmas decoration. An amazing poem Ma, it gives me pride in my name, "CHINONYELUM- God is with me"
this poem has me wishing my name is Emmanuel. Really God is with us every second, minute and hour, Knowing that he is with us we have no reason to fear. Nothing compares to the security I feel when I say Emmanuel..God is always with us. aK aChrist is indeed with us and in us for the greatest gift God ever gave to us is the gift of love and salvation through the birth and death of His son, Jesus. This is worth celebrating and am so glad that I am a recipient of this love. God is really with us always and forever. We are His children and His for love us deepens each day. His love is forever for He endureth forever. This is so lovely ma, As long as we remain faithful and dedicated to God, he abides and remain with us in all endeavor of our lives. Surely he shall neither leave us nor forsake us. "When our backs were against the wall and it looked as if it was over..." I like the feeling that through anything He is always with us. I love the reminder that even heaven and earth shall pass away but, His love for us will always be. God bless you, ma. God is with, and lives in those who keep his words. In other words he is with those who love him. When a man makes his heart homely Christ comes in and dwells forever, making ways and fighting unseen battles for him. Emmanuel. God is truly with us everytime so far we obey his.commandments. thanks for letting us know that aunty edith. yes ooo, God is always with us. he is a covenant keeping God and will be with us till the end of time like he promised. the poem is so lovely and contains the essential words to explain the meaning of the word 'Emmanuel' truly God is with us. There is everything powerful about that name 'Emmanuel.' He's always with us, always ready to help us and always ready to listen to us, even though we can't see him. this poem and the bible verses constantly remind us of God's abiding presence. That name "Emmanuel” signifies that God is always with us even till the end of time. An exciting poem it is ma, the love of God is perfect and daily it's perfecting us. The word of God says now the Lord is that spirit and where the spirit of God is there is liberty. You cannot be in the presence of God and yet your life will not be showing it, so our daily living is because of that name EMMANUEL. He is with us. His Grace has been made sufficient for us. All we need do is cue into it. His birth is the reason for our faith. His name is Emmanuel. Ma, this is an awesome exposition of the Name of our Saviour. You are blessed for our generation. This poem is an active reminder of God's everlasting presence with his people. This poem serves as a motivation and reminder of God's protection and love. I really love this poem. So much joy in my heart as i read this interesting poem... God bless you always! Short & sweet. Tha k you for this wonderful reminder of His presence & love. Emmanuel! He is always with us and this makes me feel so secure and loved. In our darkest moments. God with us! When the world shows its ugly face. God with us! Inside the darkest tunnel. God with us! He is even with us even when we think he is not there. The most merciful God is always with us! this is indeed a confirmation that the Lord is with us, everyday of our lives, in every situation whether good or bad. this has really raised my spirit. God bless you ma. interesting piece! with amazingly structured lines all built on a foundation of simplicity, these words really keeps one going, I am deeply moved by such true words. Your love and presence surrounds me and You are truly indeed with us. Emmanuel, king of all kings, he is more than wonderful. He died on the cross, where love and grace meet. thank you ma for this bible references. God is with us indeed from January to December. HE does not sleep nor slumber for our safety sake and as well gives his angel charge over us. Glory be to the father cares for us, leads us by his grace and gives us victory all the day of our lives. The Lord abides in us, His presence is eternal and everlasting and so is his love...Our comforter, Our Companion, Our helper and redeemer. i am happy he is in me. Thanks to you Ma. God name be praised! Thank God for the gift of his son, Emmanuel. I count myself privileged to partake in his Kingdom promises. Praise be unto God, Amen. Thank God that the birth of emmanuel has made me more than a conqueror. I am conscious of the fact that christ lives in me and has made me his dwelling place and of a truth his birth has made the glory of the lord upon me shine forth that men will keep seeing his glory and glorifying the father which is in heaven. What a wonderful poem MA. . Thanks a lot. Sometimes, the happenings around us would make us feel otherwise but this piece just reminded me of the ever present God. He's always with us. EMMANUEL! Thank you, Emmanuel for guiding us daily. Please continually dwell in us until our final days. A very captivating piece, all built on simplicity with such rhythm to follow up, these words are just enough to keep one going. its very motivating and grateful to remember God is indeed everywhere. God with me, sorry, i mean with us. am happy God is with me and us. a wonderful poem written for me personally. thank you ma for this piece. EMMANUEL "God is with us" indeed, God is with us, we should all always remember this anytime we are on distress or have one problem or the other. His never abandoning us no matter what. Seek him first, and every other thing will be added unto you. A very wonderful poem Aunty Edith. wonderful one, most times I ask myself is this God still in control? but you have actually made me to understand that he is with us at all times not minding the situations around us Emmanuel is with us. More grace to encourage us at all times kudos Ma. If God is with us, no evil can ever come to us Alleluia! God is indeed with His children. He is ever faithful and true to His word. His love is so extravagant. Lets stick with Him the way He sticks with us. solid rock, we trust in you. you always see us through. you're with us. no one can be against us. Indeed God is with us. He guides us through life...giving us food, clothing ,shelter,good health ,finances in everything we do it us evident that God is with Us and his name is Emmanuel. Emmanuel has been with us right from the day we were born and even till and forever, he will be with us no matter the trials and tribulations we are facing in life he is still with us.